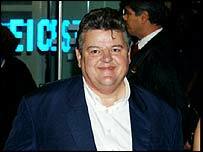 Film star Robbie Coltrane is to return to the Scottish stage for the first time in 15 years - in a Glasgow pub. The Scots actor, who starred in the Harry Potter films, is to take a lead role in a play to be performed with a lunchtime pie and a pint. Coltrane is appearing in The Brother's Suit at Oran Mor in the west end of Glasgow from 11 to 16 April. The play, part of its A Play, A Pie & A Pint programme, was written by screenwriter Peter McDougall. Coltrane, who begins rehearsals on Tuesday, said: "I have always been a great admirer of Peter's work and I am delighted to be doing a Peter McDougall play." The play's producer, David MacLennan, said: "I am very pleased that Robbie is part of our spring season and very much appreciate his support for A Play, A Pie, & A Pint at Oran Mor. It is a typically generous act."